"It started with the colour wheel," says John Dyer Baizley, frontman of psych-rock group Baroness, of his group's iconic, colour-themed album titles and covers. The band will follow up Red, Blue, Yellow & Green and Purple with their fifth studio album, Gold & Grey, on June 14; as with all of their albums, he painted the album's cover himself. "I went to art school and studied art history and theory," Baizley explains in an Exclaim! interview. "The standard artist's colour wheel goes red, purple, blue, green, yellow, orange. Orange didn't seem like a good name for this current album, but there's a lot of the colour in that painting." The cover of Baroness's forthcoming LP is one of Baizley's finest pieces yet. After taking "several hundred hours" to complete, the Dali-esque kaleidoscope marks the end of the band's chromatically themed albums that began with Red in 2007. Baroness are not the first band to name their records after colours (Weezer come to mind), but they have certainly taken the concept further than most. Baizley understands the importance of cover art. "Artwork is a totally essential part of the listening experience," he asserts. "When I say 'Dark Side of the Moon,' everyone immediately thinks of the prism and rainbow. It's what gets you that extra second of attention, which means the difference between someone listening and just passing on." And though Baizley says that every time he sits down to start a new work, "I go through a time where I do tons and tons of research," he asserts that "everything I put on there is for largely personal or specific reasons." "I always like to draw from life. I work with models, I make or find things that I'm going to include… and I sort of let the process unfold as it sparks my interest. It's not really a case of mapping everything out. I just draw and see where it goes. I think I'm operating within the stream of consciousness of the artistic world as a whole and everything is a potential influence or lesson." Together with his longtime collaborator, Dutch artist Marald van Haasteren, Baizley has created some of the most eye-catching cover art of the past decade. In addition to the Baroness album covers, he has done work for a diverse group of musicians including Metallica, Flight of the Conchords, Gillian Welch and Torche. That said, it's Baroness for which Baizley needs to consider how each album cover is different, and reflect the changes the band are undergoing. For Gold & Grey, that meant the departure of longtime guitarist Peter Adams; after the success of 2015's Purple, he left the band to be replaced by Gina Gleason. "I met Gina in Philadelphia, where we both live," says Baizley. "Pete left on really good terms and gave us time to find a replacement. I don't think there's ever been a more organic transition." Gleason, a former Cirque du Soleil guitarist and infrequent Santana jammer, has made her own mark on Gold & Grey. The album's music is just as convoluted as the artwork, full of prog, sludge, delicate piano and spacey sound effects. "It's a complex puzzle," says Baizley, "If you listen carefully, every song has references to other songs in it. Sometimes it's a melody, sometimes it's a rhythm. Sometimes it happens more than once. There's all sorts of audio Easter eggs hidden on there." Baizley isn't fond of labels, but one seems to particularly irk him. "I don't think 'stoner metal' fully covers it," he says, "If I say I'm in a rock band, people think one thing. If I say I'm in a metal band, they think something totally different. But a stoner metal band? Who wants to listen to that?" As Baroness's 'colour cycle' comes to an end, fans will be left wondering about the future. Baizley, it seems, isn't looking too far ahead. Asked about his plans, he says he has "none whatsoever. "We never expected to make six albums and finish the wheel. But I'm always drawing. This certainly isn't the end." Gold & Grey is out June 14 on Baroness's label Abraxan Hymns. 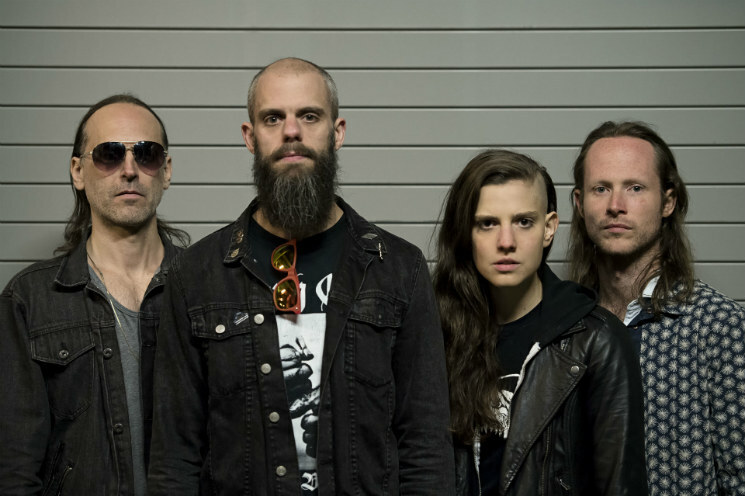 Baroness Detail 'Gold & Grey,' Share New Song "Borderlines"